Are you ready to take your meditation practice to the next level? Do you want to share the power of meditation and mindfulness with your family, friends, and community? The Ivy House is pleased to announce the McLean Meditation Teacher Academy is coming to Nashville in March of 2019. If you’ve always wanted to teach meditation and mindfulness, you can apply now to join the program. Consisting of 200 hours of training in the theory, science, teaching, and practice of meditation and mindfulness, this comprehensive program has trained over 300 people worldwide. 150 hours is done at your own pace at home, then you’ll be ready for the 8-day teacher training intensive March 22-20, 2019 at the Ivy House in Nashville. Hay House author and meditation teacher Sarah McLean, joins Corrine Champigny of the Ivy House. 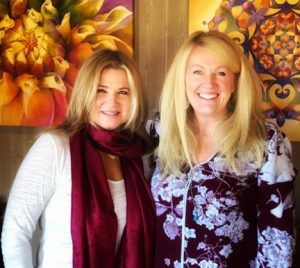 Sarah and Corrine been on similar spiritual journeys since the early 90s and are collaborating to bring you this life-transforming training. Find out more, email corrine@theivyhouse.org, or visit the website www.MeditationTeacherAcademy.com. Become a part of the 300+ certified teachers around the world who are on the peace team! * Have you been considering taking your mindfulness meditation practice to the next level? * Do you want to share the power of meditation and mindfulness with your family, friends, or community? * Hear from some of the 300 teachers who have gone through the program and are teaching all over the globe. Find out if the Meditation Teacher Academy’s 200-hour training program is right for you. Join a live information session with the Meditation Teacher Academy director, Sarah McLean and Corrine Champigny of the Ivy House. US: +1 408 638 0968, Canada: +1 647 558 0588, Ireland: +353 (0) 1 691 7488, Australia: +61 (0) 2 8015 2088, UK: +44 (0) 20 3695 0088, Hong Kong: +852 5808 6088.